On Wednesday morning I headed up to Stockholm to participate in a Generative Design workshop for Sweco. It’s been a long time since I’ve been to Sweden, so it was a fun coincidence that I already had a little taste of the country as I took my train to Zurich airport from Neuchatel. IKEA Switzerland has a special vending machine moving between the larger Swiss railway stations as part of a promotional event. It was a bit of a shame the machine was out of order, but these things do happen. The flight to Stockholm Arlanda was uneventful, and I took the Arlanda Express from the airport to the central station in Stockholm. It’s quick (20 minutes) and comfortable: it even had a business area where you could plug-in and take advantage of the free wifi. Very civilised indeed. I walked from the station to my hotel, the Haymarket. It’s a beautiful (and very trendy) hotel in the historic centre of the city. It’s right on the market square, logically enough. On checking in and walking to my room, I thought something was strange as I made two left turns from the elevator and realised there’s no possible way I could be on the outside of the building. Sure enough, I had a room with no window. I don’t mean a room with a window onto an internal courtyard… I had a room with no window. It turns out that by selecting the cheapest room in our travel booking system I’d managed to book a “cabin” room: presumably named after the fever you get if you stay in one for any serious amount of time. I hadn’t realised such things existed, but there you go. The room was very nicely decorated, but it was a little freaky never knowing whether it was day or night. A thought did occur to me… that these rooms would be useful in more northern parts of Sweden, especially at midsummer. But in Stockholm the shortest night of the year is still about 5 hours long, so it’s presumably really about real estate optimisation. After catching up on a few too many emails, I headed out for dinner. My Sales colleagues in Sweden had invited me along to have dinner with people from ÅF, who had just renewed an enterprise agreement with Autodesk. Before dinner, though, we all tried our hand at shuffleboard. Shuffleboard is played on beautiful, long, wooden tables covered with liberal amounts of sawdust. The rules are broadly similar to curling, i.e. like bowls, boccia or la pétanque, but aiming at a fixed target – the end of the table – rather than a smaller jack or cochonnet. These are all games that I’ve tried before, unlike shuffleboard. I partnered with Simon, who works for ÅF in Belgium. Here’s my best shot of the night – the only one I did that came anywhere close to the end of the table. You even get an extra point for leaving the puck hanging over the end. It didn’t stay like this for long – it was knocked off by our opposition on their next shot – but it was a nice moment while it lasted. The next day we met with Sweco at the Marriott Courtyard. Mathias Näll introduced the workshop, talking about the expectations and the three use-cases for Generative Design they’d brainstormed prior to the workshop and wanted people to explore during the course of the day. The star of the day was Paolo Serra from Autodesk Consulting, who ran the bulk of the workshop. 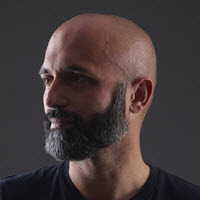 Paolo is a well-known figure to many of you: he works on all manner of consulting projects, and these days spends a significant amount of time focused on Generative Design. I really liked the approach Paolo took to introducing the topic and having people think through how best to implement their own GD workflows. The three use-cases – handled by tables 1-3, respectively – related to urban design, volumetric optimization and tenant fit-out. While the various tables all went hands-on to some degree with Dynamo and Refinery, a significant amount of time was spent thinking things through and establishing potential optimization objectives for each workflow. Interestingly, table 3 did some of their prototyping in competitive products (a member of their team was already familiar with Bentley’s Generative Components, so opted to do something with that). For me it really underlines the fact that Generative Design is really about methodology than a specific technology (although I do expect Autodesk to deliver best-in-class, game-changing Generative Design technology to our customers). After the workshop finished we headed down to the bar before having dinner at the hotel’s restaurant. The restaurant was called Björk, and was named after the Swedish name for the birch tree rather than the Icelandic singer-songwriter. Paolo and I headed back to the hotel and had another chat with our Sales colleagues before they headed off to their own dinner. The bar at the Haymarket is very nice: I stuck to a few glasses of wine, but the artisanal cocktails looked rather appealing, assuming you didn’t mind waiting the eternity it took for your hipster barman to concoct one. Even the ingredients on display looked delicious. I had a really interesting time in Stockholm. I learned a lot about Sweco and the opportunities they see for Generative Design, as well as seeing how our consulting team engages on workshops with customers. I was really encouraged to feel the energy in the room, to see the wealth of potential applications our customers see for this new technology. This is going to be a really fun journey!